For more information about the FIRST Scholarship Program, visit http://www.firstinspires.org/scholarships. 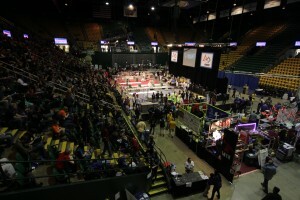 DC Regional – Mar 29 and 30 – See 116 compete! The robot is working well, and the few problems we had were quickly fixed. During our practice matches today, it seems like things were really finally coming together. In some of the practice matches, we scored 38, 46, and 58 points all by ourselves. We actually left the pits early tonight, because there was nothing left to fix, and nothing to work on! If we can keep that up, tomorrow should be pretty interesting. 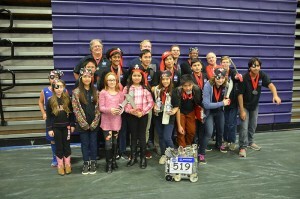 Team116’s kickoff event will be held on Saturday, January 7, 9:00a, at the Herndon High School library. Come to watch the FIRST broadcast, eat breakfast, and learn the new game for this year! The library is located to the left of the main office as you walk into Door #1 at the front of the school. All student team members’ parents are asked to attend a short parent meeting this Tuesday, Nov 8 at 7p. We’ll discuss the general team guidelines, your student’s participation, our build season, competitions, costs, and other details for the season. We look forward to seeing you there! The New Members’ Meeting will be on Tuesday, Sep 20 in the Herndon High School’s drama room! Come for the pizza, stay for the robots! Continue watching the team mailing list and here for updates!